It seems there is a widespread message today to be green. We are encouraged to recycle, compost and support sustainability. But have you ever thought to see green? To imagine what your neighborhood would be without all the trees, shrubs, lawns and diverse vegetation that give life to your world? To view the landscape that surrounds you as a softening agent in a time of all-things-asphalt? More specifically, can you picture our zoo without greenery? 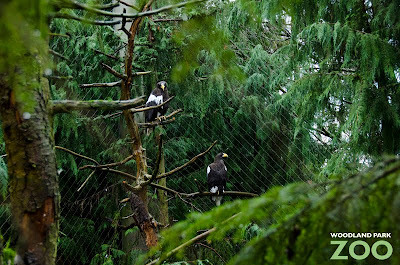 Essential to Woodland Park Zoo is a commitment to naturalistic exhibits. Over the years, much thought has been given to the role horticulture plays in exhibit design. 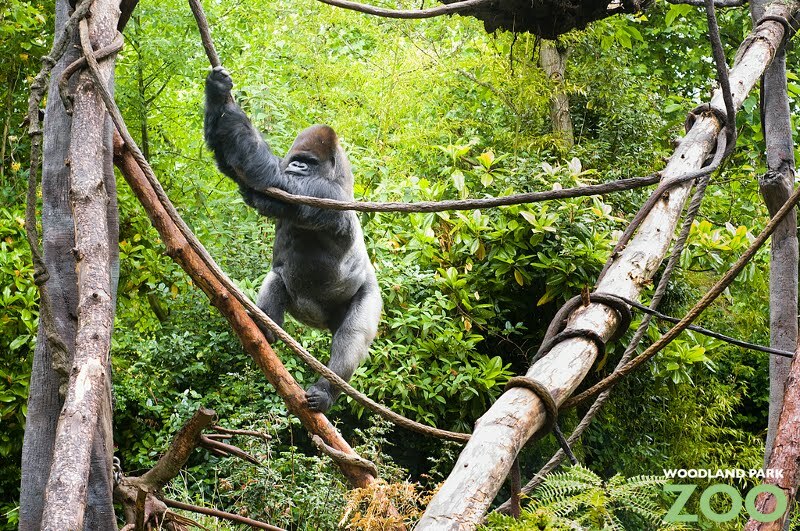 The creation of bioclimatic zones—organizing exhibits in such a way as to group together animals from similar habitats—has proven very effective. Construction plans now begin with the researching of an animal’s native environment. 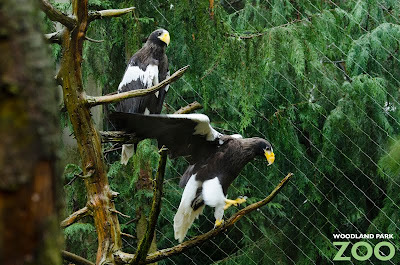 It is thought that, with proper planting techniques, our zoo education department can use exhibits to discuss animal ecology and habitat preservation. A major player in the application of this ideology across the zoo industry is the Association of Zoological Horticulture. With its advent came, not only the emphasis on naturalized exhibits, but also, according to its website, the “practice of providing plant material for animal ‘diets’ and ‘enrichment’ (things that ‘enrich’ the lives of zoo animals),” including carefully chosen plants that serve as “browse”— plants chosen to augment animals’ diets. 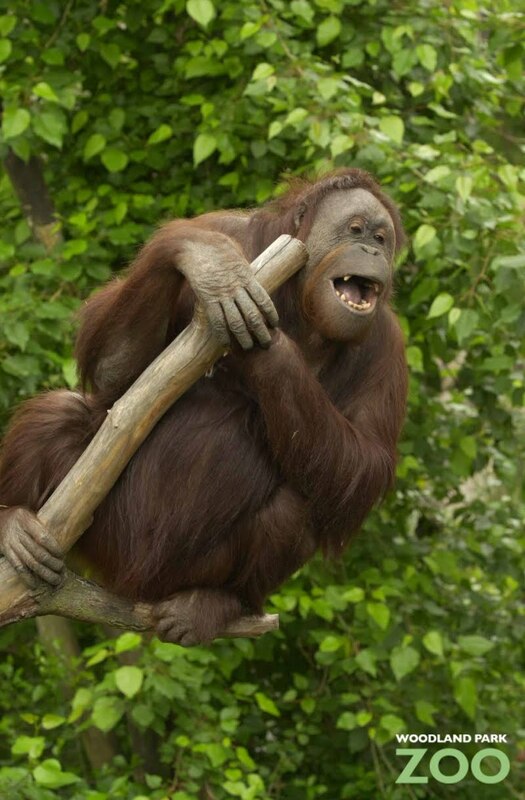 At WPZ, the horticulture staff helps provide visitors with their own enriching experience; people leave our zoo having been immersed in nature, having learned something about animal habitats and ecology, and hopefully having seen some of the amusing behaviors of our animals in their quest for browse treats! Our keepers, horticulture department, and grounds staff work daily and in varied ways for the betterment of our animals. 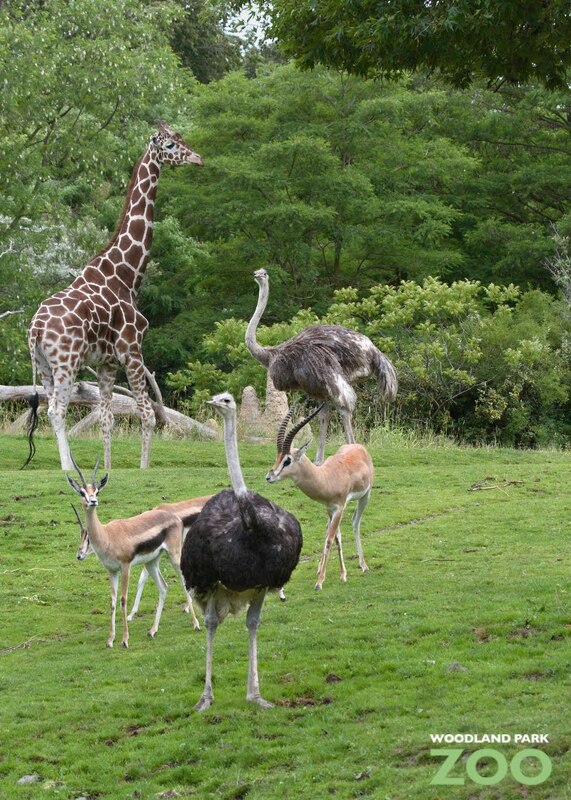 Being a team is what makes us an award-winning zoo. It takes effort to be green. Anyone able can see green. And the lives of our animals are made best when we all work together to do both. Photos (from top): Ryan Hawk/Woodland Park Zoo, Dennis Dow/Woodland Park Zoo, Dennis Conner/Woodland Park Zoo, Ryan Hawk/Woodland Park Zoo. 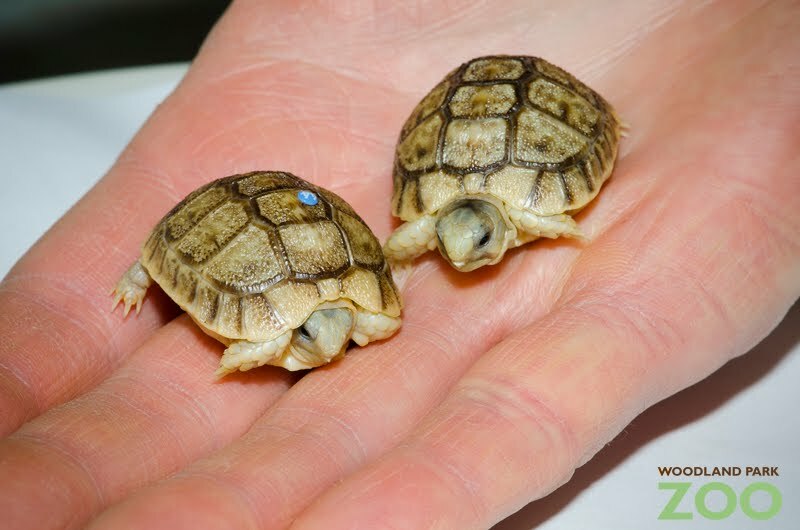 UPDATE: The two hatchlings are now on view in the Day Exhibit! Two critically endangered Egyptian tortoises hatched at the end of December and are being cared for by zookeepers behind the scenes at the Day Exhibit. 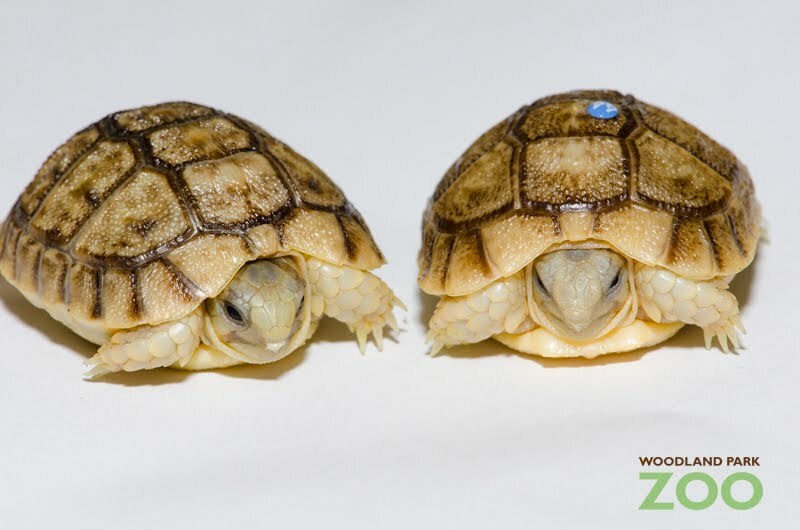 Watch this video to see the tortoises at two weeks old exploring their surroundings. This tiny desert-living tortoise is facing intense pressures in the wild. 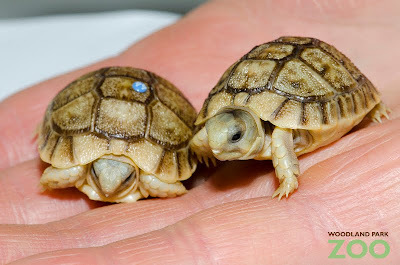 Despite its name, the Egyptian tortoise is actually now extinct in Egypt and only small populations remain in Libya. 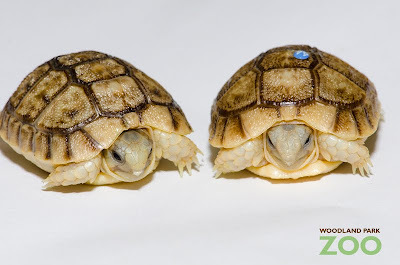 Habitat destruction and human encroachment have devastated the Egyptian tortoise’s native habitat, and the illegal international pet trade has nearly depleted wild populations. The successful hatching at Woodland Park Zoo helps maintain genetic diversity and is part of our commitment to the conservation of this species. Since 2001 we have also supported the Egyptian Tortoise Conservation Program, a multidimensional program dedicated to habitat and species conservation, research, education, capacity building and improving community livelihood. The conservation program addresses the habitat degradation and pet trade threats to wild tortoise populations by working closely with the Bedouin community, empowering them to patrol for wildlife collectors. It also engages the community in scientific research, collecting data to study the effectiveness of habitat restoration on tortoise populations. To help reduce the economic reliance on the pet trade, the conservation program operates a handicraft project that gives the larger local community an alternative, more sustainable source of income. Public outreach and visits to local schools help to raise awareness of tortoise conservation and generate a sense of conservation stewardship in the community and its future generations. 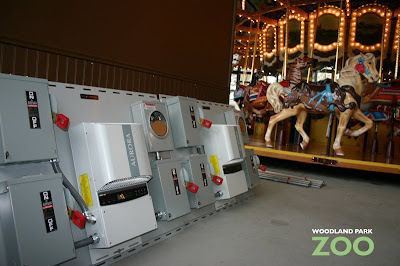 The carousel pavilion is getting solar panels this week! 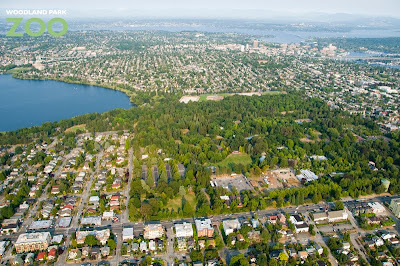 There’s a myth that solar energy doesn’t work in Seattle’s famous gray skies, so we’re especially excited for this project that will not only provide us with renewable energy, but also serve as a very public demonstration that solar energy is a viable option in our community. Big thanks to Seattle City Light for making this project possible with a generous $70,000 grant from their green power program, which is funded by voluntary contributions from customers in support of renewable energy education. The solar panels are expected to produce 9,000 kilowatt-hours annually, enough to offset the electricity required to power the carousel, which completes an average 100,000 rides per year. The 9,000 kilowatt-hours number has double significance—according to Seattle City Light, it’s also the annual amount of electricity needed to power the average Seattle home, making this project a great renewable energy model for local homeowners. Keep in mind that the carousel will be closed today through the first week of February to accommodate the installation, but as soon as that’s done, you’ll be able to take a clean, green ride. 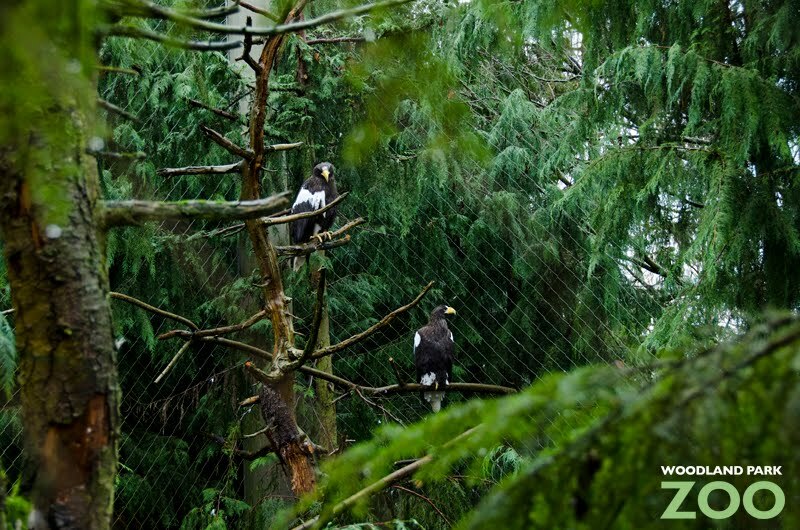 Here at the zoo, we are constantly trying to improve our environmental performance to reduce our impact on the resources we all must share—humans and animals alike. 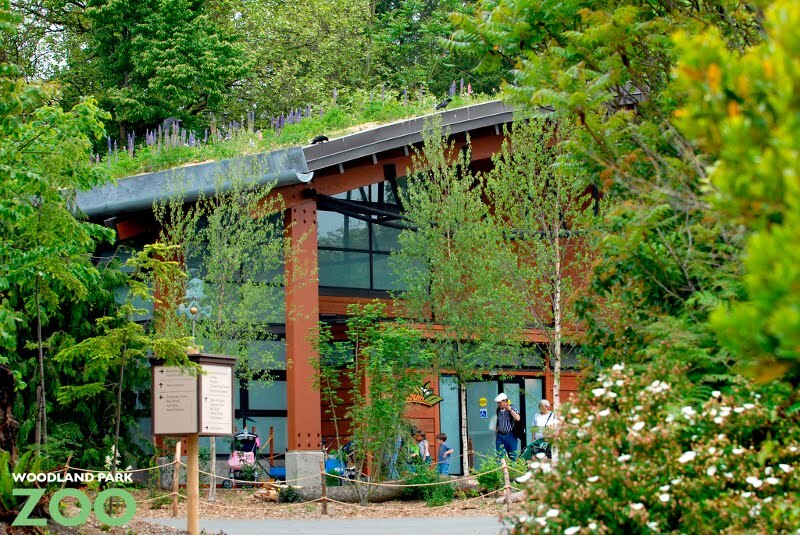 From the LEED gold certified Zoomazium, to the penguin exhibit that saves 3 million gallons of water a year, to the most inventive compost program in town—Zoo Doo—we’re always looking for ways to reduce our carbon footprint and make our operations more sustainable. The solar carousel project is just one of our latest efforts in sustainability. 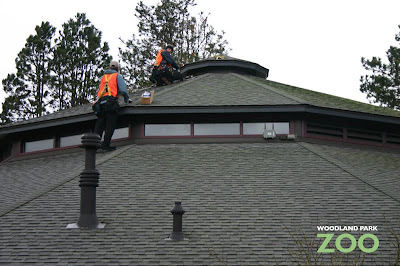 Keep an eye on our Green Zoo page and this blog for updates on the latest green projects. Carousel photos by Woodland Park Zoo. Zoomazium photo by Ryan Hawk/Woodland Park Zoo. We’ll use that feedback to help drive what kind of content we post, so please click to let us know what you think on future posts. Of course, you are also always welcome to give us feedback in the comments section of each post, discuss a post with us and other fans on Facebook or Twitter, or shoot us an email. Tip: If you are reading our blog via feed or email subscription, you may have to view the blog post online to access the feedback buttons. Ear photos by Ryan Hawk/Woodland Park Zoo. I have a passion for educating people on ways to prevent human-bear conflicts so that bears do not die needlessly because of human caused problems. Since 2006, I have worked as a field assistant for the Grizzly Bear Outreach Project (GBOP), a Woodland Park Zoo Partner for Wildlife. 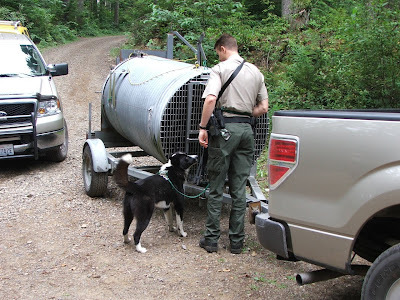 In 2010, I had the privilege to expand my work in the field, joining with Washington Department of Fish & Wildlife’s Enforcement Officer Nicholas Jorg in the Skykomish Valley to establish the Sky Valley Bear Smart Project, focusing on educating the public in the Gold Bar and Sultan communities on how to be Bear Smart. One of the most rewarding and thrilling experiences in my new position came last summer when I helped Officer Jorg handle a female bear that was roaming campgrounds in Monroe. The bear was drawn in by the temptation of food left out by a young group of campers. We darted the bear which caused her to take off running. But we had a powerful tool to help recover her—Colter, a Karelian bear dog. Karelian dogs are playing an increasingly important role in reducing human-bear conflicts. They are a unique, non-lethal wildlife management tool to deter and repel bears, reducing the number that have to be lethally removed. Soon, Colter found the bear anesthetized in the brush. She was carried out of the area and placed in a culvert trap and processed. What does that entail? Her condition was evaluated, teeth checked, a tag was put in her ear for monitoring purposes, and notes were taken on the process. When the bear recovered from the anesthetic, the door to the trap was opened. As the bear ran from the trap, Officer Jorg helped her along with a bean bag shot to her rump, which stings but does not cause damage, and Colter finished the job by chasing her back into the forest. Thankfully the bear did not have to be lethally removed, but to help prevent future issues, Officer Jorg and I talked with the campers, answered their many questions, and shared information about how to co-exist safely with bears. 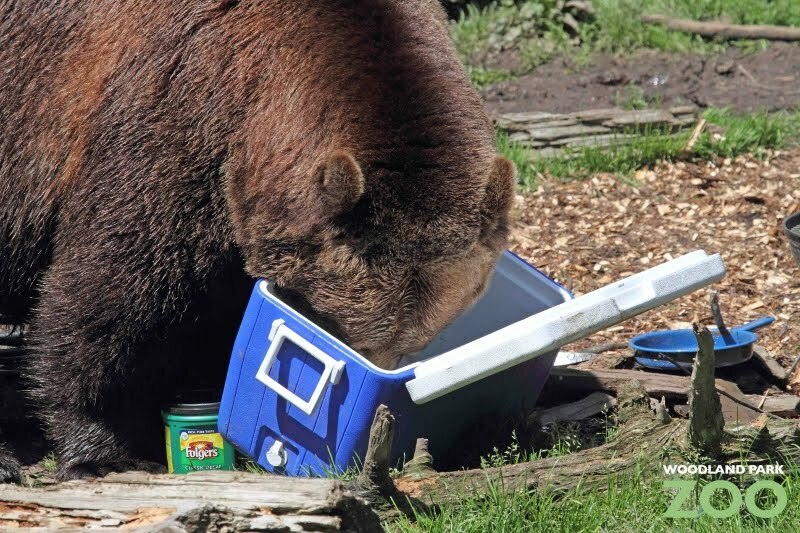 Before your next camping trip, it’s a good idea to refresh your memory on all the Bear Smart tips and what to do if you encounter a bear, available on the Grizzly Bear Outreach Project website. Or you can get a first hand look at how dangerous an unsafe campsite can be at our annual Bear Affair event, planned for June 4 this year. The Washington Department of Fish & Wildlife fields hundreds of calls each year when bears get into garbage and bird feeders, or break into cars and houses in search of food. Unfortunately, they do not always have time to respond to every call; hence, GBOP’s collaborative partnership in educating the public and talking to community members has been hugely beneficial both to the agency and the public. Working with Officer Jorg in the Skykomish Valley on similar goals keeps me motivated and inspires me to do more in the region to reduce human-bear conflicts. 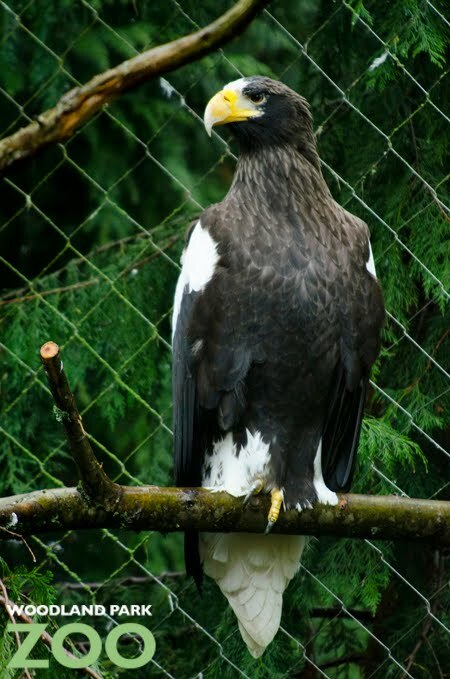 Want to help support Woodland Park Zoo and our conservation partners in the Pacific Northwest? Text WPZ to 20222 to donate $5 to the zoo today. Messaging and data rates may apply. For details visit www.zoo.org/text2give.